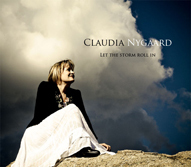 Claudia Nygaard put a smile on everyone’s face! Crossroads was very fortunate to catch Claudia Nygaard on her way through East Texas, as she headed towards Kerrville. Claudia shared her wonderful spirit with the crowd, infusing her sharp wit in the songs she performed, and the stories she shared on how certain songs came to life. She performed songs from her newest release, “Let The Storm Roll In,” along with tunes from her earlier CDs and even songs yet to be recorded. The appreciative audience really didn’t want the night to end. Claudia had to get a very early start the following morning, in order to get to Kerrville in time for an afternoon commitment. Otherwise, I’m quite sure the music would have continued even longer!